Unsurprisingly, the migrant crisis has not abated over the past few weeks. Approximately three weeks ago, a highly divisive EU vote passed, creating mandatory quotas by a qualified majority. Directly affecting national sovereignty, the vote received intense support from Germany, France, and Italy, while the UK and Denmark have opted out of the plan, voluntarily making their own resettlement plans. Two nations who previously objected to the idea of mandatory quotas, Latvia and Poland, voted with the majority. The discussions and negotiations continued yesterday, as European leaders met again in Brussels to consider questions of security around the borders of the European Union. Considering these developments, my previous questions deserve more attention. Yes, absolutely! Seventy years ago, Germany was synonymous with Nazism, hatred, and intolerable acts of unimaginable bigotry-fueled cruelty. During this crisis, while right-wing extremists may protest Germany’s acceptance of so many migrants, the overwhelming sentiment among Germans is one of welcome. I read an article a few weeks ago, an opinion piece, which discussed this change, using Munich as a case study. In World War II, the concentration camp at Dachau was a mere ten miles outside of Munich, and the Nazi leadership referred to the city as the “Capital of the Movement.” Now, Munich wants to be seen as the “city of protection and help.” A friend of mine is currently studying abroad in Munich, and has said that the German newspapers echo other Western media. Having declared themselves willing to accept 800,000 migrants, the consensus within Germany is that they must act decisively to ameliorate the situation. I have no doubt that Europe’s tragic history and Germany’s antagonistic role in the first half of the century have influence the German desire to set an example of welcome for the rest of the continent during this crisis. How many of the limitations placed on migrant movement result from a nation’s lack of capacity to accept migrants, and how many result from a centuries-old European fear of Islamic culture? I knew when I wrote this question that it was controversial, and I certainly hesitate to try to answer it now. In Samuel Huntington’s famous essay, The Clash of Civilizations, he discusses the origins of cultural (or civilizational) conflict. He outlines differences in history, language, culture, tradition, and religion as the key components of different civilizations, arguing that these varying perspectives will continue to create conflict well into the future. From the time of the Crusades to the Spanish expulsion of the Moors in the seventeenth century to the long struggle of European Christendom against the Ottoman Empire, the historically Christian Europe has been unable to come to terms with the increasing influence of Islam within its bounds. Today, while the continent-wide adherence to Christianity is much diminished, its effects are still felt. This struggle between two titanic religions has shaped European culture. With this in mind, I find myself divided in answering this question. I do believe that the limitations placed on migrant movement result from a lack of capacity to accept migrants, but I also believe that some of the reluctance to make sacrifices to accommodate the influx stems from historical discomfort with Islam. These are not complete answers to these questions, nor do they amount to expert opinions. While I have other questions from my original post that I have yet to answer, I have been returning to these two questions the most frequently as I watch Europe’s evolving reaction to the migrant crisis. In the coming weeks, I will begin to organize my thoughts on the last few questions, hopefully providing some food for thought if not definitive answers. The following post was written by department work study Rachel Bauman. Russia has been a frequent focal point of international attention since the days of the Soviet Union. The actions of the Russian government continue to confound and frustrate the international community. A recent example is Russia’s conflict with Ukraine, which continues despite ceasefire agreements and international sanctions. Yet Putin remains very popular among Russians, perhaps a partial reflection of Russians’ desire to be taken seriously in the global community, even if it means sacrificing freedoms to a more authoritarian leader. I am of the opinion that Russia, and its political system, can best be understood through the prism of history and culture. And so, with a semester of post-Soviet Russian politics under my belt and an intense (perhaps obsessive) interest in understanding the Russian people, I picked up Gregory Feifer’s 2014 book, Russians: The People Behind the Power, for a little leisure reading. Feifer, a journalist and former NPR correspondent, has a unique perspective: his American father and Russian mother met at the American National Exhibition in Moscow in 1959. Though he grew up in London and Connecticut, he spent years traveling and living in Russia, experiencing part of his heritage firsthand. There is nothing detached about Feifer’s relationship with Russians—it is peppered with stories of his mother and her family, his parents’ relationship, and his own observations experiencing and writing about Russia. That being said, Feifer still draws on outside sources—including recent surveys, historical accounts, and literature—for his background information as he argues that the factors shaping Russia today have been doing so for years. Each chapter serves to address one of these factors. Of particular interest is his exploration of “extravagance” in Russian culture—much of it a holdover from the rise of the oligarchs in the early 1990s who capitalized on the privatization of state-owned enterprises and amassed huge amounts of wealth. Moscow alone is home to more billionaires than any other city in the world. Economic inequality in Russia is a source of resentment for many Russians, who rightly conclude that many of the wealthy obtained and retain their wealth due to collusion with the government and other corrupt practices. Feifer focuses heavily on corruption as a deeply-rooted problem in Russian society. In general, political institutions are nothing more than a front for the “informal networks of crony arrangements” which rule behind the scenes. Personal loyalties take precedence just as they did in medieval Muscovy, during which time, Feifer notes, tsars would distribute their powers among ruling clans. In Putin’s Russia today, power and influence are contingent on support for the President, at least outwardly. Dissidence is easily punished in a society where bribes and threats are more influential than the rule of law, which has little historical precedent in Russia. Russia’s problems are indeed deeply entrenched, but Feifer reminds his readers that Russia is still grappling with the legacy of 70 years of Soviet rule and cannot be expected to come out of that experience without some trauma. He calls for the West to confront Russia with an understanding that the way Russia operates, and the assumptions its leaders make, are often radically different than our own. Although this book is more than a list of things that are wrong with Russia and the origins of these problems, I found it to be a very bleak read, perhaps too colored by the negative personal experiences of Feifer and his family in the past. Nonetheless, the book is engagingly written and provides many excellent insights into Russian culture and its influence on politics. It is by no means a textbook, but I recommend it as a timely supplement to more academic analyses of contemporary Russia. The following post is the second of two installments by department work study Rachel Bauman. Part One can be viewed here. Orwell clearly ties his thoughts on current political discourse to the state of language itself in his 1946 essay “Politics and the English Language,” and these opinions are an integral part of Orwell’s commentary on the totalitarian state in Nineteen Eighty-Four. He begins the essay by asserting that “the English language is in a bad way,” a situation whose origins, he believes, stem from problems in the political sphere (“Politics” 143). Orwell posits a vicious cycle of language degradation, a kind of reciprocity in which “foolish thoughts” lead to sloppy language, and imprecision of language contributes to foolish thoughts (“Politics” 143). It is thus a linguistic renewal which must occur in order to improve the level of political discourse, and Orwell argues that such a change is possible if prose writers, and particularly political writers, would turn away from the “staleness of imagery” and “lack of precision” which belie a “mixture of vagueness and sheer incompetence” (“Politics” 143-5). It is on this basis that he constructs Newspeak as one of the Party’s main methods of controlling minds in Nineteen Eighty-Four (Bolton 154). Newspeak is a tool of the Party; according to Orwell’s appendix to Nineteen Eighty-Four, the language was created “to meet the ideological needs of Ingsoc, or English Socialism” (Nineteen 312). Winston, the novel’s protagonist, receives an explanation of the principles of Newspeak from Syme, a Party philologist. Syme clarifies that, in his belief, “Newspeak is Ingsoc and Ingsoc is Newspeak” (Nineteen 55). They depend on the existence of one another, and both wield power over the individual, subsuming their identity into the mentality of the collective. Newspeak’s aim, according to Syme, who is working on the eleventh edition of the Newspeak Dictionary, is to “narrow the range of thought” by systematically narrowing the vocabulary, an idea that corresponds with Orwell’s linguistic determinism— that is, the theory that the structure and content of a given language dictates its speakers’ range of thought (Nineteen 55). By limiting language, then, the Party can control minds, ensuring that “a thought diverging from the principles of Ingsoc… should be literally unthinkable” (Nineteen 312). With this loss of language comes a loss of liberty—for example, words associated with political freedom, such as “liberty” and “equality,” are subsumed into crimethink and become independent of any meaning other than being associated with thoughts against the Party; other words which could be used to express anti-Party sentiments are deleted entirely from the lexicon (Nineteen 318). Essentially, Newspeak is a combination of Oldspeak words for everyday things and activities, purged of any meanings other than innocuous ones; words created by the Party “to impose a desirable mental attitude upon the person using them,” and specialized scientific jargon (Nineteen 313, 316, 322). It is with this power of limiting language that the Party aspires to perpetuate its social structure, subjugate its citizens, and create its own truth in order to have complete power over its people. In Nineteen Eighty-Four, Orwell makes a potent case against totalitarianism by satirizing the elements of the ideology he saw in his own society. Orwell sees politics and language as intricately linked, and the consequences of this relationship play out on a grand scale in Ingsoc. Language is the currency of the Party— it gives the Party the ability to control society as a whole, individuals, and history. With these three elements combined, the Party has the ultimate power to define reality as it sees fit. Orwell calls for a return to awareness: he “wishes us to be attentive to our use of English because he wants us to be alive to our beliefs”—mere passivity will not do (Bailey 43). As Winston writes in his diary, “Freedom is the freedom to say that two plus two make four. If that is granted, all else follows” (Nineteen 84). Where a reflective, unfettered spirit of language is preserved, so too is liberty. Orwell’s commentary on the state of the English language in political discourse is strikingly relevant today in our media-bombarded society. From the twisted words of campaign ads to the squawking of partisan pundits, current political discourse brings with it an unsettling sense that we’ve heard it all before. Perhaps, as Orwell feared, the language we use to talk about politics has narrowed—whether by simple attrition or by the limitations, even implied, imposed on it by government and society as a whole. We would do well to heed Orwell’s call to use language carefully and critically, with an appreciation for nuance. Language is too valuable, too integral to our reasoning, to be squandered on trite talking points. Bailey, Richard W. “George Orwell and the English Language.” The Future of Nineteen Eighty-four. Ed. Ejner J. Jensen. Ann Arbor: University of Michigan, 1984. 23-46. Print. Bolton, W. F. The Language of 1984: Orwell’s English and Ours. Oxford: Blackwell, 1984. Print. Newsinger, John. Orwell’s Politics. New York: St. Martin’s, 1999. Print. Orwell, George. Nineteen Eighty-four. London: Secker & Warburg, 1997. Print. Orwell, George. “Politics and the English Language.” Inside the Whale and Other Essays. London: Penguin in Association with Secker & Warburg, 1957. 143-57. Print. Orwell, George. “The Prevention of Literature.” Inside the Whale and Other Essays. London: Penguin in Association with Secker & Warburg, 1957. 159-74. Print. The following post is the first of two installments by department work study Rachel Bauman. George Orwell (1903-1950) was a profoundly political writer, with his opinions shaped by his experience with the world wars, revolutions, and political upheaval which characterized the period in which he lived. Though he is arguably best known today for his novels Animal Farm (1945) and Nineteen Eighty-Four (1949), Orwell also wrote prolifically on the political issues of his time, from the problems of British imperialism to his concerns about the Soviet Union (Newsinger x). Though Orwell’s novels were embraced by the political right in both the United States and the United Kingdom, he was actually a staunch advocate for socialism who sought to comment on the corruption of socialism by totalitarian regimes (Newsinger x-xi). Much of his criticism of contemporary totalitarianism, and the general political climate of his time, focused on the significance of language in both freeing and oppressing people, perpetuating social hierarchy, and defining truth and reality (Bolton 15, 143, 154). In Nineteen Eighty-Four, language serves all of these purposes. Language is power, and power is the Party’s ultimate goal— thus, in order for the Party to gain power “not… over things, but over men” (Nineteen 276), the Party must control language and all that it entails. In order to better understand Nineteen Eighty-Four, it is important to first gain a clearer understanding of Orwell’s political views and their development. After a five-year stint with the Indian Police in Burma, beginning in 1922, Orwell emerged from the job a hater of imperialism and a “determined opponent of authority and supporter of the downtrodden” (Newsinger 2-3). This formative time in Orwell’s life led him to adopt what Newsinger calls “a particular idiosyncratic brand of revolutionary socialism,” and he was conscious of its possible applications in the context of twentieth-century Britain (21). This rosy revolutionary idealism soon faded when, in late 1936, Orwell went to Barcelona and signed up to be a member of the POUM militia in Spain, a group that advocated for a complete revolution and subsequent dismantling of the “bourgeois state” (Newsinger 44-5). Orwell’s negative encounters with revolutionary Communists and their brutal tactics led to his claim that “Communism is now a counter-revolutionary force… using the whole of their powerful machinery to crush or discredit any party that shows sign of revolutionary tendencies” (qtd. in Newsinger 59). This distaste for Communism continued throughout Orwell’s life and was a driving force in his later works, such as Nineteen Eighty-Four (Newsinger 89). The imminent approach of war in the late 1930s shifted Orwell’s political perspectives still more. When Britain finally declared war on Germany on September 3, 1939, Orwell, who was originally anti-war, switched to a kind of “revolutionary patriotism”—he hoped that the war would provide an opportunity for socialist ideas to take hold in Britain (Newsinger 62, 66). By the end of 1942, Orwell abandoned these prospects as unrealistic; even so, he remained a socialist (Newsinger 89, 97). His political beliefs were anchored in a strong opposition to the Communism of the Soviet Union, which he believed had bastardized the ideals of true socialism (Newsinger 110). Socialism in Orwell’s mind was “a democratic classless society where private property had been replaced by common ownership of the means of production”—it was nothing like the totalitarian regime which emerged in the post-war Soviet Union (Newsinger 112, 119). Orwell was particularly disturbed by the public’s lack of understanding about the distinctions between socialism and communism as it was being practiced in the Soviet Union, and it became his goal to dispel this false notion in order to restore respect for socialist ideas (Newsinger 110). With this goal in mind, Nineteen Eighty-Four should be viewed as not an attack on socialism, but rather as a satire of totalitarianism, which Orwell viewed as “the culmination of a trend in his own time that alarmed him” (Newsinger 130, Bailey 40). Not a prophetic vision, exactly, but a satirical projection of where Orwell’s conception of the toxic political climate, if not rectified, might lead (Bailey 23-4, Bolton 151). The rise of modern China is fascinating material for anyone to study. College students in particular are growing up into young professionals who will interact with Chinese culture and politics far more than previous generations. A nation of 1.3 billion people, with a unique history and set of values, China demands attention and respect from around the world. But what is life like in modern-day Chinese culture? What can we learn from China’s past to help us understand the future of Chinese involvement in international affairs? Out of a desire to train students in relevant and real-world politics, the Department is offering a class on China for the Spring 2013 schedule. Modern Chinese Politics, taught by department chair Dr. Paul Rego and attended by both majors and non-majors, presents students with exciting class discussion that challenges assumptions about China. For International Politics. . . In China Shakes the World, James Kynge details the rise of the Chinese economy and predicts the challenges the country will face in the future—including energy and environmental concerns—that will have far-reaching impacts around the world. Students are asked to write a paper in response to Kynge’s argument. Students also participate through social media on Twitter to share relevant political news outside of class. For Chinese Politics. . . Since this entire class is focused on China, students need a basic understanding of Chinese culture and society before delving into what makes up present day China. 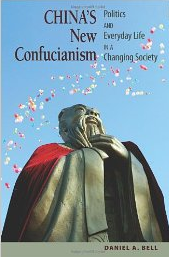 The first book they are reading is China’s New Confucianism by Daniel A. Bell, a Canadian professor teaching in China. Exploring some of the less-known aspects of Chinese culture, Bell takes readers through the basic tenets of Confucianism, through the karaoke bars of Chinese night life, the treatment of domestic workers, and the Chinese education system. Students in this class have already written research papers about the history of marriage in China and Chinese theory of just war, to name a few topics. These classes offer only a snapshot of the wide range of possibilities for Politics majors interested in world affairs. We hope students are as excited as we are about new classes like this…maybe a few of them will choose to study in China through Messiah’s study abroad program!